Amniotic Fluid Index; Antenatal Ultrasound; Chronic Kidney Disease; Hydronephrosis; Ultrasound Imaging; MAG3; Urinary Tract Infection. Antenatal ultrasound (US) detects structural fetal abnormalities in 1% to 3% of all pregnancies. Of these, approximately 20% are genitourinary anomalies, and hydronephrosis is the most commonly occurring amongst those.1 A meta-analysis by Lee et al,2 indicated that newborns with antenatal hydronephrosis (ANH) are at greater risk of having renal pathology. Moreover, a recent single-center study in Saudi Arabia revealed a prevalence of 0.3% kidney and urinary tract anomalies, half of which had hydronephrosis. Detecting the degree of hydronephrosis during antenatal US can help in planning postnatal management. Several grading systems have been used, of which the anteroposterior diameter (APD) of the renal pelvis is the most common, with cutoffs for mild, moderate, and severe as defined in the Society for Fetal Urology (SFU) consensus statement. We sought to assess postnatal outcomes of ANH and correlate the degree of ANH and grade of hydronephrosis at the first postnatal US with various events during the first year of life including the frequency of urinary tract infections (UTI), surgical intervention and its outcomes, and development of chronic kidney disease (CKD). Following approval by the King Fahad Medical City Institutional Review Board, a retrospective study was conducted at the Neonatal Intensive Care Unit, King Fahad Medical City, Riyadh, Saudi Arabia. All newborns diagnosed with unilateral or bilateral antenatal isolated fetal hydronephrosis detected by antenatal US from August 2005 to February 2011 were included in the study (n = 105). Classification of CKD was performed by standard methods.5 Cases of fetal hydronephrosis associated with other major congenital anomalies including renal agenesis, multicystic dysplastic kidney, and polycystic kidney disease were excluded as these cases have different postnatal outcomes and management plans. A diagnosis of hydronephrosis was based on renal pelvic dilatation as described in the SFU 2010 hydronephrosis consensus statement,6 defining ANH as mild, moderate, or severe based on APD measured in the second (mild: < 7 mm; moderate: 7 to 10 mm; severe: > 10 mm) or third (mild: 7 to < 9 mm; moderate: 9 to ≤ 15 mm; severe: > 15 mm) trimester by antenatal US. In our institution, the protocol includes postnatal US for every newborn with ANH at 48 hours old, followed by a micturating cystourethrogram (MCUG) if the postnatal US reveals any grade of hydronephrosis. If the MCUG shows no reflux, a mercaptoacetyltriglycine (MAG3) scan is ordered depending on the severity of the case according to our institution protocol [Figure 1]. Technetium dimercaptosuccinic acid (DMSA) scan is considered if there is renal impairment since birth. Data obtained up to one year of age included results of renal US, MCUG, MAG3 scan, DMSA scan, urine culture, and management of UTI. Data about antenatal US findings was extracted from the electronic medical records, including bladder wall thickness and amniotic fluid index (AFI). Bladder wall thickness was measured; < 2 mm is considered normal. The amniotic fluid volume was assessed by AFI. An AFI < 5 cm is considered as oligohydramnios, > 24 cm polyhydramnios, and 5–24 cm is considered normal.7 In our study, we considered the results of the last antenatal US before delivery since those patients with early hydronephrosis that disappeared were not referred to us. All cases with a secondary cause of hydronephrosis like posterior urethral valve (PUV), pelvicureteric junction obstruction (PUJ), and vesico-ureteric reflux (VUR), were referred to a pediatric urologist. All cases of PUV were operated while other causes depend on renal function and US follow-up. Postsurgical intervention with renal US and renal function were obtained. The outcome at the end of one year was classified as spontaneous resolution, resolution after surgical intervention, development of CKD, or persisting hydronephrosis with normal renal function. Data was summarized using mean±standard deviation and frequencies and percentages, as appropriate. The statistical analyses were performed using SAS software (SAS Institute; Cary, NC). The difference in both the diagnosis and degree of hydronephrosis between the antenatal US and the first postnatal US was considered significant when the p-value was < 0.050. Likewise, the relationship between the degree of hydronephrosis and the evidence of underlying pathological cause was considered significant if the p-value was < 0.050. Figure 1: Protocol of hydronephrosis management at King Fahad Medical City, Saudi Arabia. Of 105 patients included in the study, most were males (n = 83; 79.0%), with a median gestational age of 38 (range 35–41) weeks at birth [Table 1]. We found no correlation between bladder wall thickness and grade of hydronephrosis in antenatal US except in PUV cases [Table 2]. Table 3 shows no correlation between the volume of amniotic fluid in antenatal US and the grade of hydronephrosis in postnatal US. Table 1: Gender and amniotic fluid index (AFI) in the postnatal hydronephrosis. Data presented as number (%). Table 2: Correlation between bladder wall thickness and grade of hydronephrosis in antenatal ultrasound. Table 3: Correlation between the amniotic fluid index (AFI) and grade of hydronephrosis detected by the first postnatal ultrasound. Comparing antenatal and postnatal US kidneys revealed 33 cases with mild hydronephrosis postnatal US: seven cases normal, 17 mild, eight moderate, and one severe. In moderate antenatal US, six cases were normal, 14 mild, 10 moderate, and five severe at postnatal US. In severe antenatal hydronephrosis, seven cases were normal, eight mild, 11 moderate, and 11 severe at postnatal US [Table 4]. 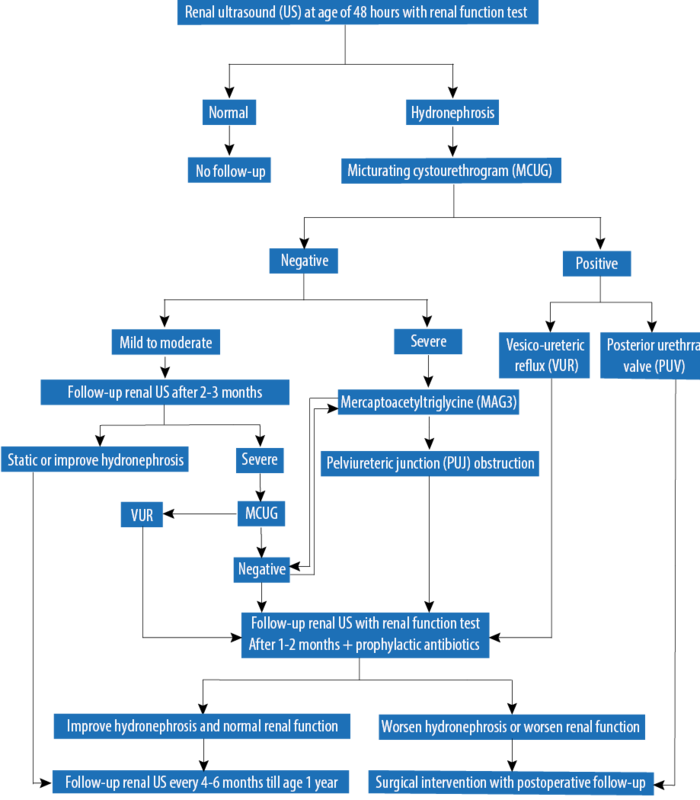 MCUG was abnormal in three cases who had normal first postnatal US, seven cases with mild, seven cases with moderate, and seven with severe hydronephrosis in first postnatal US [Table 5]. MAG3 according to degree of hydronephrosis. The more severe the degree of hydronephrosis, the more likely MAG3 shows obstruction. Table 4: Comparison of the grade of hydronephrosis between prenatal and postnatal ultrasound (US). Table 5: Pathology by the degree of hydronephrosis (postnatal ultrasound). MCUG: micturating cystourethrogram; PUV: posterior urethral valve; MAG3: mercaptoacetyltriglycine; PUJ: Pelvicureteric junction..
Table 6 shows the final diagnosis in these cases based on all investigations done. The diagnosis was made according to the grade of hydronephrosis using first postnatal US. Of the 20 cases found to have no hydronephrosis by first renal US, 11 had normal kidneys, two were diagnosed with reflux disease, six were diagnosed with multicystic dysplastic kidney disease and one with solitary renal cyst. Six cases had severe hydronephrosis detected at the first postnatal US; PUJ was the final diagnosis in 11 out of 17 cases. The final diagnosis in these cases included PUV in three cases, primary hydronephrosis in one case, and VUR in two cases. Oligohydramnios was seen in five cases during antenatal US, out of which three had PUJ obstruction, one had multicystic dysplastic, and one had VUR. A total of 28 cases needed surgical intervention, which had an underlying pathological cause of hydronephrosis. The first postnatal US revealed mild, moderate, and severe hydronephrosis in four, 10, and 14 cases, respectively [Table 7]. Postoperative US at one-year-old showed improvement in the grade of hydronephrosis except for two cases that did not improve. However, all cases maintained normal renal function. Only one case had two episodes of UTI postoperatively. Twenty-two (20.9%) cases resolved spontaneously at one-year follow-up. Twenty-six patients were cured following surgery (n = 26; 24.7%); however, the condition persisted in 52 (49.5%) patients with normal renal function. Four (3.8%) patients were lost to follow-up. Table 6: Etiology of hydronephrosis (first postnatal ultrasound). Table 7: Cases that need surgical interventions. One baby who had no signs of hydronephrosis at first postnatal US developed stage 3 CKD due to grade 5 bilateral VUR, which was discovered by renal US at six months old during UTI screening. In eight cases although the first postnatal US showed no evidence of hydronephrosis, the subsequent US revealed hydronephrosis with normal renal function [Table 8]. The number of infants that underwent corrective surgery was 28 (26.6%) and the condition resolved completely in 26 (92.8%). Of those who underwent corrective surgery, 14 (50.0%) had severe, 10 (35.7%) had moderate, and four (14.2%) had mild hydronephrosis at first postnatal US. Very few positive cultures were obtained for UTI episodes in the first year of life for those followed in our hospital. We considered most patients might have more episodes of UTI diagnosed and treated in other hospitals. Table 8: Outcome of hydronephrosis at one-year-old (first postnatal ultrasound). Data presented as number (%); CKD: chronic kidney disease. The majority of infants with hydronephrosis are male and also had severe hydronephrosis. We found no correlation between bladder wall thickness and severity of hydronephrosis in antenatal US. We also found no correlation between AFI and the severity of hydronephrosis assessed by first postnatal US. However, a large-scale study is needed to ascertain the value of these diagnostic parameters in hydronephrosis. Our study has shown that the severity of the condition usually diminishes during the postnatal period; however, the condition may deteriorate in about a quarter of affected newborns. Parents must be made aware of this possible outcome. Moreover, we noted that only one newborn classified initially as mild hydronephrosis from the first postnatal US deteriorated to severe hydronephrosis signifying that the chances of the condition progressing from mild to severe is rare. From the moderate group, however, a slightly larger proportion, a little over a quarter, deteriorated to the severe form suggesting that the moderate and severe forms require a better management strategy to prevent worsening of the condition. This variation between antenatal and postnatal US to detect the grade of hydronephrosis makes counseling of parents crucial. Indeed the present study found that newborns with mild and moderate hydronephrosis at first postnatal US persisted with the condition throughout the one-year study period but exhibited normal renal function. However, newborns found to have severe hydronephrosis at first postnatal US required surgical intervention to maintain their renal function. Postnatal US must be performed for every newborn with ANH, followed by MCUG if there is any grade of hydronephrosis. If the postnatal US reveals severe hydronephrosis, MAG3 should be done for those that had normal MCUG. Yerkes et al,9 evaluated 60 infants who had less than grade 2 unilateral or bilateral hydronephrosis seen on US performed at one month of life. MCUG was positive in 15% of the infants. Similarly, we noted that two cases with normal postnatal US subsequently showed the development of VUR, which indicates the need to follow-up with US and MCUG for all newborns with ANH to detect any abnormalities at the appropriate time. Thus, there is a need to draw proper procedural guidelines and formulate criteria for healthcare providers for imaging (MCUG, MAG3) in the postnatal period. We prescribed prophylactic antibiotics for all babies with hydronephrosis and UTI suspected in over half. Antenatal US is essential for detecting hydronephrosis while postnatal US is imperative for parental counseling and management. Follow-up with US after delivery is important in any newborn with ANH regardless of normal first postnatal US as this may help to detect missed cases of VUR. Even though newborns with ANH are at greater risk of developing renal disease, in a vast majority, the outcome appears favorable. We found no correlation between the grade of hydronephrosis and bladder wall thickness antenatally except in PUV cases. AFI in most cases did not correlate with the severity of hydronephrosis postnatally. The majority of ANH improved spontaneously, which can reassure the family. The majority of those cases who needed surgical intervention majority recovered after surgery. The authors declared no conflicts of interest. No funding received for this study. Kennedy WA. Assessment and management of fetal hydronephrosis. Neoreviews 2002 Oct;3(10):214e-219e. 2. Lee RS, Cendron M, Kinnamon DD, Nguyen HT. Antenatal hydronephrosis as a predictor of postnatal outcome: a meta-analysis. Pediatrics 2006 Aug;118(2):586-593. Coplen DE, Austin PF, Yan Y, Blanco VM, Dicke JM. The magnitude of fetal renal pelvic dilatation can identify obstructive postnatal hydronephrosis, and direct postnatal evaluation and management. J Urol 2006 Aug;176(2):724-727, discussion 727. Zerin JM, Ritchey ML, Chang AC. Incidental vesicoureteral reflux in neonates with antenatally detected hydronephrosis and other renal abnormalities. Radiology 1993 Apr;187(1):157-160. Kliegman RM, Stanton BM, Geme JS, Schor NF. Nelson text book of pediatrics. 20th ed. 2016. Nguyen HT, Herndon CD, Cooper C, Gatti J, Kirsch A, Kokorowski P, et al. The Society for Fetal Urology consensus statement on the evaluation and management of antenatal hydronephrosis. J Pediatr Urol 2010 Jun;6(3):212-231. Harding LJ, Malone PS, Wellesley DG. Antenatal minimal hydronephrosis: is its follow-up an unnecessary cause of concern? Prenat Diagn 1999 Aug;19(8):701-705. Yerkes EB, Adams MC, Pope JC IV, Brock JW III. Does every patient with prenatal hydronephrosis need voiding cystourethrography? J Urol 1999 Sep;162(3 Pt 2):1218-1220.